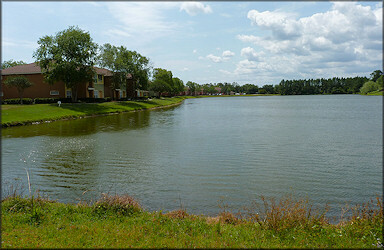 During a follow-up field survey on May 12, 2012, this reporter visited the lake at Country Club Lakes Apartments (number 1 on the map above), literally across the street from the Johns Creek community lake (but apparently not physically connected), and discovered that it too had a population of Pomacea maculata. The snails in this lake, which had virtually no aquatic vegetation, were larger than those of the Johns Creek Community lake and the population appeared to have been present for a longer period of time. Only a few egg clutches were seen indicating that the snails were not, for whatever reason, effectively propagating. On May 24th a follow-up visit was made to the apartment complex and a thriving Pomacea maculata population was also found in a small pond near the entrance to the complex off Hodges Boulevard (number 2 on the map). The much larger lake nearby (number 3 on the map) also was found to contain Pomacea but only a modest number of specimens and their egg clutches were seen. 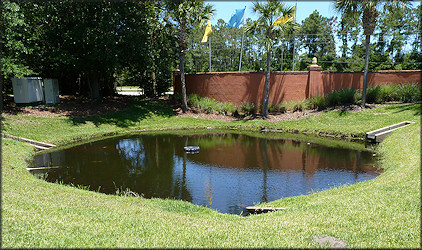 It appeared that the small pond and the nearby larger lake were connected via an underground culvert. A June 6th visit to the apartment complex revealed that a large Pomacea maculata population was also present in the smallest of the the three lakes in the complex (number 4 on the map). It appeared likely that this lake was connected to the nearby larger lake (number 3 on the map) via an underground culvert. On February 12, 2014, an Email message, accompanied by images, was received from a Jacksonville resident reporting that he had recently found two large empty snail shells in the compost bin of his church (Hodges Boulevard Presbyterian Church). 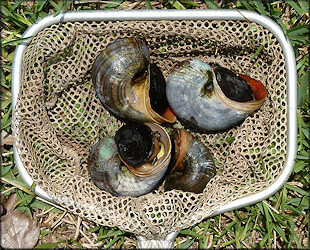 The images depicted a large Pomacea maculata. The next day this reporter visited the church and immediately adjacent lake/retention pond and confirmed that the lake housed an apparent thriving Pomacea population (number 5 on the map). 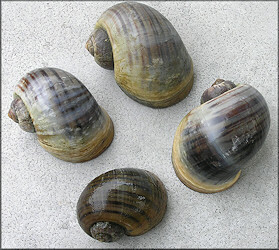 Empty shells, snail eggs, and one living specimen were found at the site (see image). This particular lake/retention pond had not previously been surveyed during 2012. It cannot be explained how the Pomacea shells got into the compost bin but the hand of man is suspected.